Name of the Recruitment Authority : Telangana State-Northern Power Distribution Company Limited (TSNPDCL). Mode of Application: Apply Online. Name of the Designation: Junior Accounts Officer (JAO) Posts. Number of Vacancies: 107 Jobs. Advertisement Release Date : 31st May 2018. Initial Date to Apply Online: 16th June 2018. End Date to fill Online Application: 30th June 2018. Start Date for Payment of Application Fees : 15th June 2018. Last Date to Pay Application Fees : 30th June 2018. 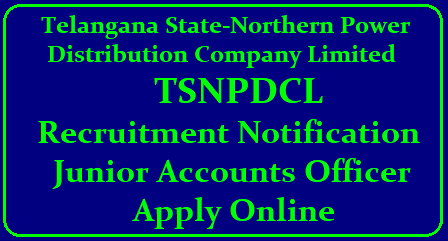 The Northern Power Distribution Company Of Telangana Limited (TSNPDCL) broadcasted an advertisement notification. Hence, here is the great news for the candidates of Telangana who are looking for the job in Government Sector. In addition to this, interested job seekers can check the detailed information regarding TSNPDCL Recruitment 2018. Furthermore, TSNPDCL Careers is having 107 unfilled vacancies in TSNPDCL Warangal. Therefore, TSNPDCL Cgg Gov In equipped with Junior Accounts Officer (JAO) Posts. Candidates should have finished B.Com 1st Class or M.Com 1st Class from an approved institution. Else, Aspirants must have done CA/ICWA – Inter from a recognized institute or University. Maximum Age Requirement – 44 Years. The Northern Power Distribution Company Of Telangana Limited (TSNPDCL) issued advertisement notification for 107 TSNPSC Jobs. In addition to this, you can go through the detailed information explained in this article and fill and submit TSNPDCL Online Application Form before the last date. Aspirants should go through the procedure mentioned below regarding filling of TSNPDCL Application Form. As a result, candidates are suggested to make a note that TSNPDCL Online Apply link will be available from 16th June 2018 to 30th June 2018. So, apply as soon as possible. When the home screen of the official portal is displayed, click on Careers section start searching for TSNPDCL Notification 2018 pdf. Download and open advertisement notification of TSNPDCL JAO Recruitment 2018. Go through the details in TSNPDCL Recruitment 2018 Notification and verify your eligibility. If you are eligible and willing to apply, then click on TSNPDCL Recruitment 2018 Apply Online link mentioned below or on the official portal. When an application form is opened, start filling the required sections such as your information and the gained educational qualifications. Later, upload your latest photograph, signature, and the required documents in the prescribed format. Finally, Re-verify all the entered details and at last, click on Submit Button. In conclusion, take a print out of the successfully submitted application form for further reference. Initial Date to Apply Online : 16th June 2018. End Date to fill Online Application : 30th June 2018. TSNPDCL Exam Date: 22nd July 2018. On this page, I have provided only an overview info regarding TSNPDCL Recruitment 2018. In addition to that, if in case, you face any queries then make a visit to TSNPDCL Official Website and download TSNPDCL JAO Recruitment 2018 Notification pdf. As a result, you can also click on the below link to download TSNPDCL Notification 2018 PDF.